Ingredients: Black tea, pistachios, rose petals, marzipan, natural pistachio flavoring. The aroma and flavor of this tea match perfectly. Nutty pistachio and sweet marzipan drops complement each other, making this one smooth and delicious sip. This is definitely a customer favorite! The black tea is on the milder side, so we could enjoy this in the later afternoon without too much caffeine. Mug (8oz water):1.5 level tsp • 205º • Steep for 4 min. Teapot: (8oz water): 2 level tsp • 205º • Steep for 3 min. My new favorite tea. Sweet but not too sweet and so satisfying! I did not expect to like this tea when it showed up with my subscription box, but boy was I wrong! The nuttiness of the pistachio blends perfectly with the sweet marzipan. This tea is full of flavor! 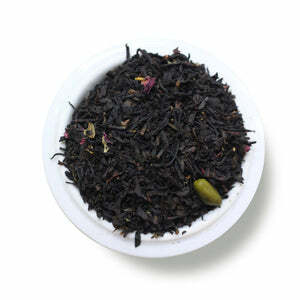 The marzipan flavor leads the taste profile of this tea, and if you like marzipan, you'll love it. 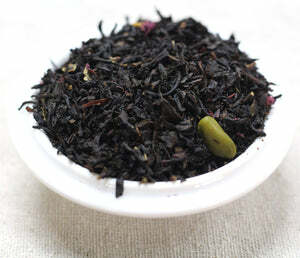 The marzipan flavor is balanced a bit with the addition of the pistachio, which gives the tea a slightly nutty taste. There are rose petals in the tea, but they get overpowered by the marzipan almost entirely. With a little cream and sugar this is a delicious morning treat that has the mouthfeel of a coffee. This could be my Favorite tea. I was shocked at the amount of almond flavor that was present, often almond is hard to reproduce but this is spot on. The mild nuttiness of the pistaschio lets the almond star in this one...its fantastic. I've had the sample size, came back for the 3 oz and will buy again and again.